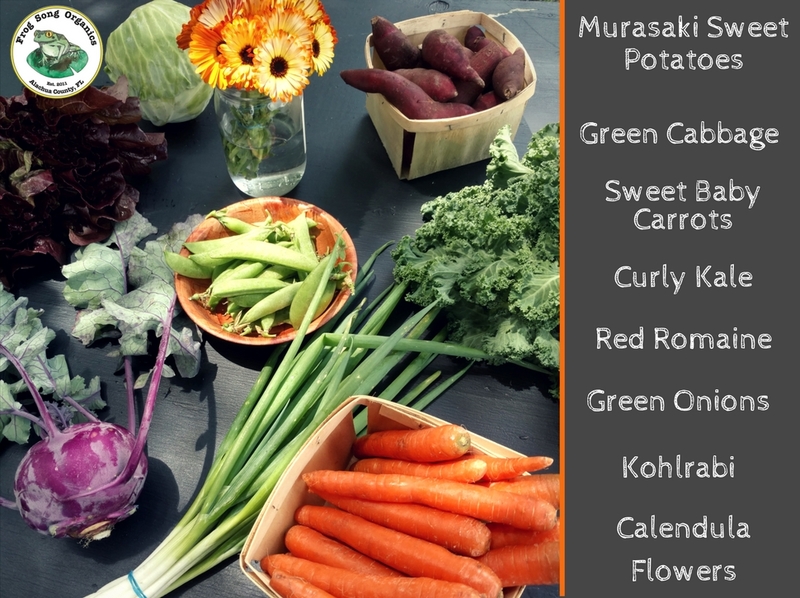 Murasaki Sweet Potatoes- Crimson skin with a white flesh, these little fingerling potatoes are perfect for roasting. Don’t waste your time peeling them, give them a good wash and cut them up into bite size pieces or just enjoy them whole. Scallions- Are they scallions or green onions?? Both. 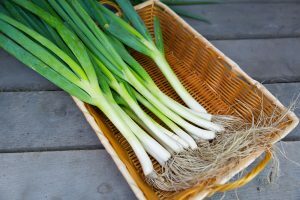 Green onions and scallions are actually the same thing! They are either harvested very young from the regular bulb-forming onions we are familiar with, or they can come from other varieties that actually never form bulbs. All parts of the long slender onions are edible from root to tip. They can be eaten raw or cooked and they make for a beautiful garnish. Sweet Baby Carrots- These sweet baby carrots are delicious in a variety of ways, cooking them is the sweetest way. Try roasting them with the white sweet potatoes in your share using the special Root Spice Mix Chef Amy Rupert Secol created. Kohlrabi- Kohlrabi gets its name from the German word for cabbage “Kohl” and turnip “Rubi.” The taste and texture of kohlrabi are similar to those of a broccoli stem or cabbage heart, but milder and sweeter. Make sure to peel the purple skin before cooking it. Once the skin is peeled you can eat it raw, thinly sliced in salads or cooked, cut the bulb in chunks and enjoy it as a topping on your pizza or pureed in soups. Sugar Snap Peas- These crispy sweet peas offer lots of nutritional value, and they’ll help you reach your recommended daily intake of Iron, Vitamin A, and Vitamin C. Eat them on their own raw or pair with healthy dips such as garlicky hummus or baba ganoush. You can also include chopped sugar snap peas in your pasta dishes for added crunch, or lightly drizzle the peas in sesame oil, toss with some sesame seeds or sunflower seeds, and roast until tender for a flavorful, healthy side dish. Red Romaine- This red variety tastes no different than the green romaine, but it does offer an inviting, colorful addition to the traditional tossed green salad. Green Cabbage- There’s no wrong way to eat green cabbage. To reap its maximum nutritional benefits eat it raw in slaws like this Cabbage and Jicama Slaw – substituting the kohlrabi in your share for the Jicama, unless you have Jicama, then by all means, give it a go. 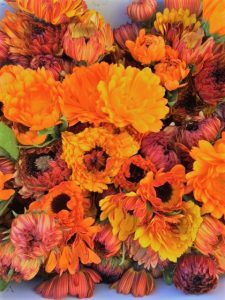 Calendula- Surprised to see flowers in your share? Not only are they beautiful to look at they are wonderfully healthy and edible. Sprinkle the calendula petals in a tossed green salad with your red romaine and some sugar snap peas. Curly Kale- Nutritious, tasty, and versatile, curly kale is a great staple vegetable. It that can be added to pasta, risottos, soups and stews. I find the easiest way to eat kale is to remove any tough stalks and chop down some of the bigger leaves. Saute with some sesame seed oil and chopped garlic. Here is a recipe she made up for us using the kale in her share. She tries to use ingredients that are in season and locally sourced when possible. Check out some local farms for blueberries in your area. Blueberry season is upon us and U-Picks are a great way to visit your local farms, engage with the farmers, and experience what it’s like to work on a farm, And there’s nothing more satisfying than making from your fresh, hand picked ingredients. Kale has lots of nutrients but they can be a bit hard for the body to absorb. One way to increase absorption is to chop it really fine and to add a dressing that contains oil. The oil in this dressing helps increase the absorption of at least 7 different nutrients in greens in this salad according to researchers at Iowa State University who found that a spoonful of oil makes vegetables more nutritious. Wendy White, the lead researcher on the project said that it makes less difference what type of oil. The added oil aided in absorption of alpha and beta carotene, lutein and lycopene – two forms of vitamin E and vitamin K. The oil also promoted the absorption of vitamin A, the eighth micronutrient tracked in the study, which formed in the intestine from the alpha and beta carotene.